The history of Crowthorne goes back quite a long way, originally the village was once merely a hamlet, a smallish one a that, but that changed when in the 1800’s Wellington College opened, which was followed only several years later by the opening of the well known Broadmoore Hospital. In between that period the railway station came into succession. It didn’t take long for the village to grow in size from that point. Today Crowthorne is nearing 7,000 people and there’s ample more to be offered than there ever was historically. A slightly less known attraction, if we do say so ourselves, is our hog roast catering. Taste the Cracklin isn’t quite as old as Wellington College or Broadmoore, but non the less we’ve been making up for lost time, sending waves through village events with an unmatchable spit and tray roast skill set. We bring to the table a sizeable depth of knowledge like nobody else. Merging hog roasting with the best in event planning, our capability for conjuring up enticing event packages knows no bounds. We don’t care for limits or defeat, no matter how high the bar is set we’ll meet it; set us any challenge, we’ll beat it. It’s hard to argue with a hog roast Crowthorne. Not only is a hog roast magnificent, it’s also a safe option, at it’s core it’s two ingredients: pig and bread, there’s also stuffing and apple sauce but if your guest doesn’t want these they don’t need to, there’s no shortage of great condiments not the less. We’re booked by clients knowing that not only is the hog roast a genuine spectacle of event food, it’s the double whammy, because they know spit roasted pig is something we all enjoy. In addition to that, our clients guests who don’t like pork get to have an alternative dish which will be cooked just for them. We’re not in the business of lying, as far as we’re concerned it doesn’t come any better than a spit roasted pig, but the vegetarian friendly alternative runs a fair 2nd. When you book us for your hog roast Crowthorne event you’re making a sound investment, because the hog roast service of ours is better than you could imagine. We have fully professional waiting teams at our disposal, team members to provide a front of house, drinks bar, and other wonderful services that make our hog roasts truly unique. Putting bulk to our claim, we’re also experts in outdoor cooking. Hog roasting was invented for outdoor cooking, so it only follows on that our hog roast catering is a top class choice if your event is taking place at an outdoor venue. Our chefs are anything but one-trick ponies though, if roasted pig with copious cuttings of crunchy crackling isn’t doing it for you, we’re sure that either roasted chicken, roasted turkey, roasted lamb, roasted sirloin of beef, roasted chicken kebab, or even grilled sausages and burgers made by the chef himself will whet your appetite. And that right there is only the spit snack part, it’s well worth keeping in mind that we do more than that, if you fancy a look at the menu page you’ll be taken aback by all the food items on our menus, especially with how much multi-choice there is for certain menus. You can cover all bases by choosing numerous of each dish for your guests. If you’re a true hog roast lover, or if you’re on a bit of a tight budget, another avenue to go down is hog roast hire Crowthorne. 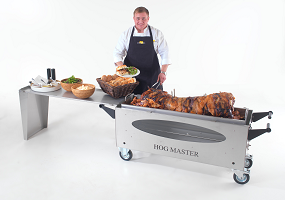 It’s a no hassle service that puts you behind the hog roast machine or spit roast machine. Making scrumptious food with the machines comes without difficulty, and our clients who use the service are constantly reminding us just how much fun they have with it, some even prefer it to catering because they enjoy it that much. There’s no difficulty in hog roasting which is probably why people take to it and enjoy it so effortlessly, even if you hire and make your own hog or spit roast with hog roast hire in Crowthorne, you can still mix it up and enjoy your event, because the hog roast only requires an occasional look over it now and then. Think of it like a long barbecue, you can throw your pig on the spit and almost forget about it! So don’t forget to have a look at the machine hire page after you’ve viewed our catering menu section because you never know, hog roast hiring just might be the right plan for you.